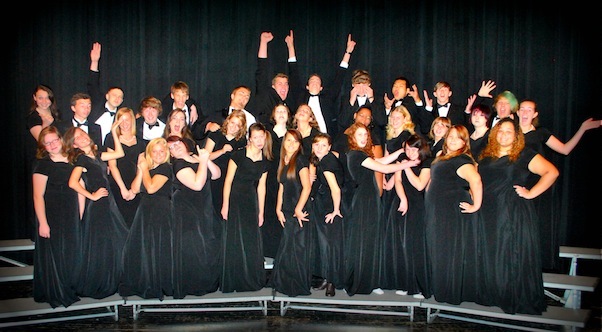 The Brevard High School Concert Chorus is the premier performing ensemble at Brevard High School. Under the direction of Mary Beth Shumate for the past twenty-three years, they perform extensively at the community, state, and national levels and, in addition to New York, Washington, DC, Atlanta, and Williamsburg, have toured in Germany, Switzerland, and Austria. In 2005, through a rigorous selection process, the BHS chorus was chosen as one of three high school choruses in the nation to perform the Durufle Requiem at the second annual Carnegie Hall National High School Choral Festival under the direction of Craig Jessop, Morman Tabernacle Choir conductor, and the St. Luke Orchestra. Each spring the chorus consistently receives superior ratings in performance and sight reading at the North Carolina State Choral Festival. Their annual activities involve a madrigal dinner in December and a Broadway musical in the spring. Highlights of their 2012-13 season include performing as the featured choir at the Gardner-Webb Choral Festival, participating in a master class with internationally renowned conductor Rollo Dilworth in Philadelphia, and singing in Washington, DC and at St. John the Divine Cathedral in New York City. Mary Beth Shumate has served for twenty-three years as director of choral and theatre activities at Brevard High School. In addition to annual madrigal dinners in December, each spring she directs and produces a Broadway musical. BHS choruses have performed in numerous venues throughout North Carolina, many locations in the eastern half of the country including Washington, DC and New York City, and in Europe. Ms. Shumate is a member of the American Choral Directors Association and is the state secretary for the High School Choral Division of the North Carolina Music Educators Association. She is a National Board Certified teacher and was the 1998 Transylvania County Teacher of the Year. Ms. Shumate received the bachelor of music education degree from Abilene Christian University in Texas and the master of music education degree from the University of South Florida. According to a famous story that even its protagonists told many different ways, librettist/lyricist Alan Jay Lerner and composer Frederick “Fritz” Loewe met by accident at the Lambs Club in New York in 1942. One or the other of them, depending on the version, was on the way to the men’s room and recognized the other, and, either on the spot or shortly thereafter, they agreed to collaborate on a musical that was to begin rehearsals in two weeks. That show, Life of the Party (which also employed lyrics by Earle Crooker), closed after only nine weeks, and their next two collaborations, What’s Up? (1943) and The Day Before Spring (1945), also flopped commercially. But they scored a huge hit in 1947 with Brigadoon, which established them as the most successful new Broadway team. Tensions in their working relationship caused lyricist and composer to part ways, but their great potential for success kept bringing them back together. They reunited in 1951 for Paint Your Wagon, which unfortunately failed on Broadway, and again in 1956 for My Fair Lady, which became the longest-running show of its time and remains an artistic pinnacle among musicals. Two years later Lerner enticed Loewe to set his lyrics for the film Gigi, which won nine Academy Awards in 1959. Their last Broadway collaboration, Camelot, was fraught with challenges—director Moss Hart’s heart attack, Lerner’s marital problems, the show’s original excessive length, initial poor reviews—yet it went on to win four Tony Awards, was made into a 1967 movie, and defined the era of the Kennedy administration. lyricism, born out of his European operetta experience. Expectations ran high for Lerner and Loewe’s next musical after their fantastic success with My Fair Lady, and, despite mixed criticism for Camelot’s trial performances, advance ticket sales topped three and a half million dollars. Featuring a stellar cast that included Richard Burton, Julie Andrews, Robert Goulet, and Roddy McDowell, the show opened officially on December 3, 1960, and ran for a respectable 873 performances on Broadway and 518 more at London’s Drury Lane Theatre. Four Tony Awards, the original cast album, tours, revivals, and an HBO adaptation brought more fame despite continuing criticisms of the show’s story, and commentators agree that the memorable music is some of musical theater’s best. Camelot’s adaptation of T. H. White’s esteemed novel The Once and Future King involves the romantic triangle of King Arthur, Queen Guenevere (spelled thus in the musical), and Sir Lancelot, set against the treachery of Mordred and featuring all the pageantry associated with the knights of the Round Table. Tonight’s selections open with the cheerful title song, which Arthur sings to Guenevere to assure his bride-to-be before their arranged marriage that Camelot is a wonderful place in which to live. In “What Do the Simple Folk Do?” from Act II, Arthur and Guenevere wonder what it would be like to live without all the responsibilities of ruling England. The set closes with one of Lerner and Loewe’s most memorable romantic ballads, “If Ever I Would Leave You,” sung by Sir Lancelot at the outset of Act II, when he refuses to leave Guenevere even though she must remain faithful to King Arthur. Lerner and Loewe’s only musical set in America, Paint Your Wagon opened on Broadway on November 11, 1951, and ran for 289 performances. There followed a West End revival in 1953 and a 1969 Hollywood film, which Lerner produced on an altered story, without Loewe’s collaboration and with huge expenses that overshadowed its considerable box office take. The show’s Western scenario—which perhaps seemed exotic enough to count as “foreign”—involves gruff prospector Ben Rumson, his daughter Jennifer, and the people of the California gold rush town that bears his name. Jennifer falls in love with Julio, a Mexican prospector, but her father sends her away to attend school in the East. When she returns a year later, the townsfolk are packing to leave with news of a new gold strike, but Ben wants to stay in Rumson despite its fading prosperity, and Jennifer remains there to wait for Julio. When Julio returns several months later, the now dying Ben welcomes him and the lovers embrace against the backdrop of the ghostlike town. Julio and Jennifer sing the lovely “I Talk to the Trees” in Act I as they discover their mutual attraction. Soon after, the miners, led by Steve Bulmarck, reflect on their lonely life in “They Call the Wind Maria” (muh-RYE-uh). In Act II miner Mike Mooney sings the beautiful “Another Autumn” as he considers looking for another lake he’s heard about with gold dust on the bottom. We return to Act I for the charming “How Can I Wait,” in which Jennifer happily anticipates seeing Julio again. The Finale reprises the first act’s rollicking “There’s a Coach Comin’ In,” in which the prospectors, starved for female companionship, plan to kidnap some women from a neighboring town, and, from the opening scene, “I’m On My Way,” the prospectors’ cheerful anticipation of finding gold. After talking to Lerner about making a film version of Colette’s novella Gigi, Hollywood producer Arthur Freed spent several years acquiring the rights. Lerner then tried to get Loewe interested in writing the music, but was unsuccessful until he promised that they could write in Paris rather than Hollywood. Meanwhile Freed and Lerner cast Maurice Chevalier, Leslie Carron, and Louis Jourdain in the leading roles and hired Betty Wand to dub Caroon’s singing voice. Directed by Vincente Minnelli, the filming took place in Paris and Hollywood and went considerably over budget. Gigi’s soft opening in 1958 won enthusiastic audience approval, but Lerner and Loewe insisted on making costly changes. In the end their belief in the film paid off both critically and at the box office, and in 1959 Gigi garnered a record nine Academy Awards. Set in end-of-the-nineteenth-century Paris, the story centers around Gigi, who is being trained to be a wealthy man’s mistress by Madame Alvarez (her grandmother Mamita) and Great Aunt Alicia, themselves aging courtesans. Gaston—nephew of aging boulevardier Honoré Lachaille, who once had a love affair with Mamita—has often found relief from the boredom of high-society life by spending time with Gigi and her grandmother. After Gaston realizes that Gigi has grown from a tomboy into a beautiful young woman, he offers to make her his mistress, but Gigi wants nothing less than marriage—which totally shocks her grandmother and aunt. Finally admitting to himself that he has fallen in love with her, Gaston asks for her hand in marriage. Just before the Cinderella ending, Gigi sings the poignant “Say a Prayer for Me Tonight” having decided she’d rather be unhappy as Gaston’s mistress than be without him. To return to the movie’s opening, Honoré sets the scene with “Thank Heaven for Little Girls,” voicing his appreciation for the young girls he sees playing in the Bois de Boulogne who will soon grow up into beautiful women. Later Gaston has lost a game of cards to Gigi as she impishly imbibes the champagne her grandmother had poured for him, and in the effervescent “The Night They Invented Champagne” they celebrate her prize—that he take her and her grandmother on his seaside vacation. Once at Trouville, Honoré and Mamita charmingly reminisce in “I Remember It Well” about one of their long-ago amorous outings—which they remember completely differently. Our set closes with the movie’s title song, which Gaston sings as he realizes that Gigi is no longer the awkward little girl he knew and that he is attracted to the woman she has become. Lerner and Loewe’s fourth collaboration and their first big hit, Brigadoon opened at the Ziegfeld Theater on March 14, 1947, and ran for an impressive 581 performances. Several producers had turned down the show, but Cheryl Crawford took it on after Lerner and Loewe objected to some racist wording in the contract Billy Rose had offered. Agnes de Mille choreographed the show, incorporating elements of Scottish dance to fit the scenario of a mysterious Scottish village that appears out of the mist only once every one hundred years. David Brooks starred as Tommy Albright, George Keane as his pal Jeff Douglas, and Marion Bell as Fiona MacLaren, with whom Tommy falls in love. The ensuing London production ran for 685 performances, and the show has seen numerous revivals, an altered 1954 film version starring Gene Kelly and Cyd Charisse, and notable 1966 television version starring Robert Goulet and Sally Ann Howes. Lerner later denied that he had drawn on any older story, but commentators noted a resemblance to Friedrich Gerstäcker’s Germulshausen, about a mythical village under a curse. In Lerner’s scenario, American vacationers Tommy Albright and Jeff Douglas stumble upon a Scottish village where they meet Fiona and her younger sister Jean, who are preparing for Jean’s wedding to Charlie Dalrymple. Tommy and Fiona fall in love even though he has a fiancée in New York, but Jeff persuades him that he can’t stay in the mysterious village. After several unhappy months back in New York, Tommy convinces Jeff to return with him to look for Brigadoon. Miraculously the village schoolmaster appears saying, “I told ye when ye love someone deeply enough, anythin’ is possible, ” and Tommy disappears into the mist to rejoin Fiona in Brigadoon. The Overture consists of dance themes from the wedding festivities and an instrumental version of “From This Day On,” which Tommy later sings as he bids Fiona farewell before heading back to New York. Charlie Dalrymple sings the tender ballad “Come to Me, Bend to Me” when he goes to sign the MacLaren family bible, but is told he can’t see Jean on their wedding day. In the lovely duet “The Heather on the Hill” Tommy tries to persuade Fiona to let him come with her to gather heather for her sister’s wedding and eventually succeeds. Earlier Charlie Dalrymple gets to sing another of the show’s most melodious songs when he reveals in “I’ll Go Home with Bonnie Jean” that he’s giving up his skirt-chasing and looking forward to married life with Jean. This evening’s selections conclude with “It’s Almost Like Being in Love,” in which Tommy ecstatically tells Jeff how happy he was with Fiona on their heather-gathering trip. She reenters to join him in this effective “almost-love” duet. Starring Rex Harrison as Professor Higgins and then little-known Julie Andrews as Eliza Doolittle, My Fair Lady opened on Broadway on March 15, 1956, following successful trials in New Haven and Philadelphia. The musical’s immediate success resulted in an unprecedented run of 2,717 performances. Several years earlier, lyricist Alan Jay Lerner and composer Frederick Loewe had abandoned an attempt to make a musical adaptation of George Bernard Shaw’s play Pygmalion—metaphorically based, in turn, on Ovid’s classical myth of Pygmalion bringing his statue of Galatea to life. Others had also tried and failed to adapt Shaw’s play, including Rodgers and Hammerstein. Lerner and Loewe’s success the second time around, Lerner said, owed to the realization that Shaw’s play actually needed little changing. In 1964 the film version of My Fair Lady won eight Academy Awards, including Best Picture, Best Actor (Rex Harrison), and Best Director (George Cukor). Julie Andrews wasn’t yet a film star, so Audrey Hepburn had been cast as Eliza, with singing dubbed by Marni Nixon—and, as it happened, Hepburn lost the Oscar to Andrews in Mary Poppins! My Fair Lady tells the story of phonetics professor Henry Higgins giving speech lessons, deportment, and etiquette training to Cockney flower girl Eliza Doolittle in order to pass her off as a well-born lady. What begins as a bet and a “lab” experiment begins to have more serious implications as he finally realizes he can’t do without her. Tonight’s selections include the instrumental Overture, featuring the “Embassy Waltz” from the scene at the Embassy Ball in which Eliza dances with prince of Transylvania and passes her final test, and “The Ascott Gavotte,” from her first public tryout at the famous horse races. The vocal selections follow the story chronologically for the most part, beginning with “Wouldn’t it be Loverly,” in which Eliza as a poor flower girl wonders what it would be like to live an upper-class life, and “With a Little Bit o’ Luck,” which, sings her father, is all one needs to avoid the rigors of hard work, temperance, and marriage. In “The Rain in Spain” Eliza, Professor Higgins, and his friend Colonel Pickering celebrate her big breakthrough in her diction lessons, and in “I Could Have Danced All Night” Eliza ecstatically sings that she couldn’t possibly go to bed after all the excitement of the ball.